Updated by Zoey Miller and verified by the thebabbleout.com Research Team. Last updated on September 3, 2018. A baby food pouch will allow your baby to feed himself/herself while you are busy doing other things. Sure, you can buy your baby food in pouches, but there are a couple of issues with it. Firstly, you are limited to the food that you can buy. There are limited flavors and can be quite expensive to keep buying. And secondly, you might want to make your baby food that is healthier compared to the pre-packaged product you find on the aisle of the supermarket. Reusable baby food pouches can solve both of these problems. 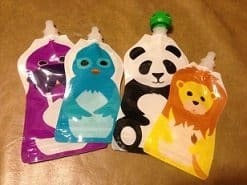 These pouches are designed to be reused so that you have the flexibility of a baby food pouch at a fraction of the cost. Now, as convenient as the reusable baby food pouches are, they can be a mess to buy. There are too many brands on the market and if you don't know what to look for, get ready for a big disappointment. Not all pouches are designed equally. Some of these pouches are great while some others leave much to be desired. How do reusable baby food pouches work? What to look for in reusable baby food pouches? The reusable baby food pouches are as easy to use as they are convenient. Using these pouches is as easy as using a plate and a spoon. There are three steps to using a reusable baby food pouch. The first step is to fill the pouch with your favorite home-cooked baby food. To do this, you open the seal on the pouch and use a funnel or a similar device to fill in the puree of the baby food. Once the pouch is filled with the food, you can hand it to your baby when the baby needs to be fed. The baby can eat the food right out of the pouch through the plastic spout by either sucking the pureed food or squeezing the pouch. The third step is to clean the pouch after the use. Just fill some water in the pouch and rinse I thoroughly, that's it! So, as you can see, the reusable pouches are incredibly easy to use. While there are no official 'types' of reusable baby food pouches, we can divide them into the following two types based on the positioning of the spout. As the name suggests, the spout on these pouches is placed on the side of the pouch at an angle. More often than not, you fill these pouches from the top, and they have a broad base and can be propped on the table. On the downside, these pouches can be a tad difficult to clean. Also, as the arrangement of the spout is different than a milk bottle, there is a learning curve for the baby. These pouches have a spout on the top. They are filled from the bottom and as a result are incredibly easy to clean. Also, as they have a spout at the same place as a baby milk bottle, there is almost no learning curve. Both these designed are more or less equally popular. However, I always prefer the top spout pouches simply because they are easy to clean. That said, some side spout pouches are designed quite intelligently to allow for an equally easy cleaning. Before you select a reusable baby food pouch, you should know what to look for while selecting one. Here are some of the things that you should be paying attention to while picking out these pouches. Safety is one of the most important considerations for any baby product, and reusable pouches are no exceptions. As most of the pouches on the market are made from some form of plastic material, ensure that they are free from toxic chemicals. Some of the nasty chemicals that should be completely avoided include BPA, PVC, and Phthalate. These chemicals tend to leak into the contents of a pouch and are known to have toxicity. There are plenty of great options on the market that are free from these chemicals and always make sure you are picking those over the cheaper options that may contain these chemicals. As a rule of thumb, I prefer not to buy a pouch if it is not explicitly mentioned that the plastic is BPA and Phthalate-free. The size is also an important factor to consider. If you have an infant, he/she will need less food compared to a toddler. Picking a bigger pouch that you might need is always better than picking one that is too small. The sizes of these pouches are usually mentioned regarding ounces and range between 3 to 7 ounces. Pick a size that is best for your intended use. Cleaning a reusable baby food pouch can be a nightmare if the pouch is not designed properly. If the pouches are not cleaned properly, they can be breeding grounds for bacteria and other disease-causing microbes. Hence it is important to pick the pouch that is easy to clean and quick to dry. Look for pouches that have a wide opening that will allow you to scrub the insides thoroughly. If you dig a little bit or buy our recommended pouch, you can get one that is dishwasher safe. These pouches can be cleaned thoroughly with the push of a button. If you are someone like me, you prefer to make your baby food in bulk and throw it in the freezer. 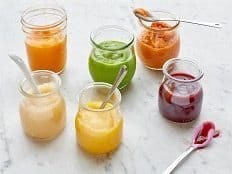 Some baby food pouches are freezer safe, and you can fill these pouches and throw them right into the freezer so that you have them ready when you need them. There is a clear indication on the pouch whether it freezer-friendly or not. Never make the mistake of freezing a pouch that is not freezer safe. WeeSprout is perhaps one of the best-known reusable baby food pouches on the market. These pouches tick all the right boxes and are designed to perfection. The pouch has a plastic spout that is on the top of the pouch. You can fill the pouch from the bottom and has a double-zipper for extra security. It is completely leak-proof, and it has never leaked in my experience. The plastic used in the construction is 100% BPA and phthalate-free and can be used over 100 times. In my experience, the pouch can be used for about 80-85 times before it shows signs of wear and leakage. There is also a clear window on the side of the pouch that lets you keep track of the contents inside. The pouch is incredibly easy to clean as well. The bottom has a wide opening, and you can easily use a scrub to get the insides thoroughly cleaned. Each packet contains six reusable pouches. You can get them in either 3.4 ounces, 5 ounces or 7 ounces size. Alternatively, you can get an 'assorted' pack with two pouches of each size. I have had no major problems with these pouches and feel no hesitation in recommending them. The Squeasy Gear takes a markedly different approach compared to the rest of the pouches on this list. Rather than using a collapsible plastic material, this pouch uses a food-grade silicone material in its construction. It is more a squeezable baby bottle than a pouch. However, when it comes to usability, the Squeasy Gear comes through as a winner. It is easy to fill and wash and excellent for liquid foods such as milk and juices. The silicone used in the construction is BPA, Phthalate, and PVC-free. The pouch is dishwasher and freezer-friendly and will last for a long time. If you are in the market for a pouch that will last you for years, the Squeasy Gear is your best option. Although I am not a huge fan of the side spout design, the Little Green Pouch reusable pouches forced me to change my opinion. 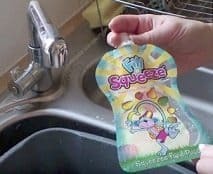 While most side spout pouches are notoriously difficult to clean, the Little Green Pouch is extremely easy to clean, which was a pleasant surprise for me. The pouches are made from a 100% BPA and phthalate-free plastic. The double zipper makes sure that the food never leaks in your diaper bag as well. The pouch is also easy to fill from the top. These are completely safe to be used in a dishwasher and are freezer-friendly as well. One of the gripes with some side spout pouches is that they can be a tad difficult to squeeze, but the Little Green Pouch is quite different from them. The pouches are easy to squeeze, and the baby can eat effortlessly. You can also buy a special funnel for these pouches at additional cost to make filling easy. However, it is in no way necessary to use these pouches. They are available in a package of four pouches and variety of sizes ranging from 3.5 to 7 ounces. 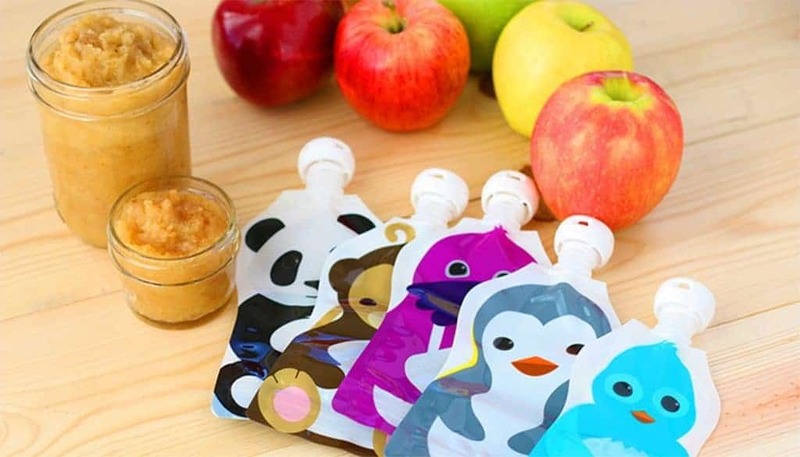 If you are looking for the cutest yet durable, reusable baby food pouches, then the Squooshi pouches are for you. Hands down, these are one of the cutest pouches on the market. The animal themed pouches will keep your baby engaged and entertained while he eats. The pouches are made from a softer plastic material compared to other pouches which make it easy for the baby to use them. They are 100% PVC, BPA, and Phthalate free. It is also quite easy to fill the pouch as well. The top spout position allows the pouch to have a wide bottom opening that is easy to clean and fill. The pouches are dishwasher and freezer safe as well. Yaya pouch is perhaps one of the most economical reusable baby food pouch on the market that has managed to keep the quality high. The top sprout pouch is easy to clean and fill. It is made from 100% BPA, Lead, Phthalate, and PVC-free. The pouch also has a large clear window for an easy estimate of the remaining contents. The pouch has a double zipper that is leak-proof. The rounded corners allow for an easy and efficient cleaning. All you need to do is add some water and rinse the pouch off in a few quick minutes. One of the most attractive features of this pouch is the affordability. You get 50 pouches in every bag which are quite the bargain. Although they don't last as much as some others on this list, they are worth the money. After reviewing some of the best reusable pouches for baby food on the market, the WeeSprout ﻿﻿Reusable Food Pouch outshines the competition. It is a great reusable baby food pouch that is easy to clean and fill. The pouch is made from a material that is 100% PVC, Phthalate, and BPA-free and is quite durable as well. If you are in the market for a reusable baby food pouch that gives you the best value, you can't go wrong with the WeeSprout Food Pouch. If you loved this article, don't hesitate to share it with you family and friends! Zoey is our baby equipment expert. Her topics are: baby, diapers, feeding, and pregnancy. She graduated from Teachers College, Columbia University and worked at nursery and kindergarten. Unfortunately she had some issues when she wanted a baby, but she eventually solved the problem and gained huge knowledge in this topic. She is a mother of 2 and her expertise has been accumulated from her nursery job and her own life with Naomi and Daisy.